Providing contraceptive methods to clients at the same visit they request them can increase patient satisfaction and reduce the risk of unintended pregnancies. According to the 2016 U.S. Selected Practice Recommendations for Contraceptive Use, there is no medical reason to require clients to return for a follow-up visit or wait until her menses to initiate contraception if the provider can be reasonably certain a client is not pregnant. 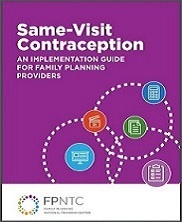 The Family Planning National Training Center developed Same-Visit Contraception: An Implementation Guide for Family Planning Providers to help family planning providers implement proven strategies in Title X clinics. This implementation guide offers suggested action steps, tools, and other resources inspired by family planning providers offering the full range of methods same-visit. Title X grantees and service site staff such as managers and clinicians may find this guide and associated tools useful as they begin—or streamline—offering same-visit contraception. The tools and resources in this guide can be used in any order according to needs and priorities. JSI/Family Planning National Training Center, 2018.